2019 Max Exposure Combine: 60+ College Coaches in 2018! College baseball coaches have very limited time and money due to NCAA mandates to scout high school players. On the other hand, there are dozens and dozens of events each weekend of the summer and fall filled with hundreds of teams and thousands of aspiring college players. To help you get more “LOOKS” this summer we want to explain what a “FOLLOW LIST” is, why college coaches and scouts use “FOLLOW LISTS” and why they are IMPORTANT to you and how you can GET ON THE LISTS! It would be a nightmare for college coaches to keep up if not for their trusty “Follow Lists”. To stay organized and maximize the time and travel money they spend on recruiting, coaches develop and rely on “Follow Lists” to determine where they will go and who they will scout/recruit this summer. We have a solution to help you get the undivided attention you need to get a good, long “look” from a slew of college coaches eager to build their follow lists for the summer. 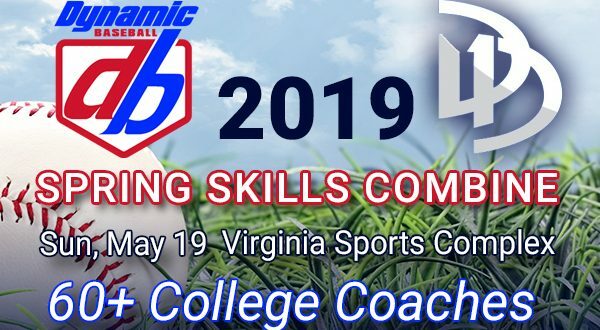 Dynamic Baseball & D1Draftable have joined forces to bring you the 2019 Max Exposure Combine at Virginia Sports Complex on Sunday, May 19, 2019. PAYMENT OPTIONS: You may pay online with a credit card or by mailing a check. You can choose the option to pay by check at the end of the registration form. Instead of entering your credit card information, simply click the “or pay with cash or check” link and complete the registration. If you choose to pay by check please mail your payment to Dynamic Baseball Combine 415 Westwood Office Park Fredericksburg, VA 22401. Please include the player's last name in the memo line. Dynamic Baseball & D1 Draftable put on some of the premiere events on the East Coast and has become a favorites among college coaches and professional scouts over the past 10 years due to the talented players that come to our events. Don't miss this opportunity to show off your ability and skills in front of numerous college coaches and professional scouts. Don’t be left behind! MAY 19, 2019 is YOUR DAY TO SHINE! Everything about this event has been thoughtfully designed to give you an advantage this summer. It will put you in the best possible light, so your abilities can shine brightly before a large contingent of coaches who are eager to add to their follow lists before the summer season gets rolling. In other words, May 19, 2019 is all about you! D1Draftable Baseball is going to be bigger and better than ever in 2019. Join us as we showcase the top college development programs on college campuses across the Commonwealth. From Blacksburg to Harrisonburg, from Lynchburg to Lexington, and from DC-Charlottesville, from Richmond to Norfolk we have the top D1 and D3 schools covered. You must first create a free tourney team account if you have NOT played in a D1Draftable event in the past two years. Find the event and age group you wish to enter from the list below. Select the Register button and it will take you to the login page. If you already have a free team manager account, enter your username and password. If you have not already created your account (it's free and only takes a minute to create) select sign up button and follow the prompts. More on D1DRAFTABLE TOURNEY TEAMS. In partnership with Tourney Machine, we are excited to offer team managers a groundbreaking, state of the art tournament management tool that will bring all of your D1Draftable tournament business under one umbrella. Whether you run one team or an entire organization spanning multiple ages, you can quickly and easily manage all your tournament entries under one login. For instance, use the same login to register one team for one event or register multiple teams in multiple events. Enter rosters once and update as needed. When the event starts you will have all the scheduling information and instant updates at your fingertips.